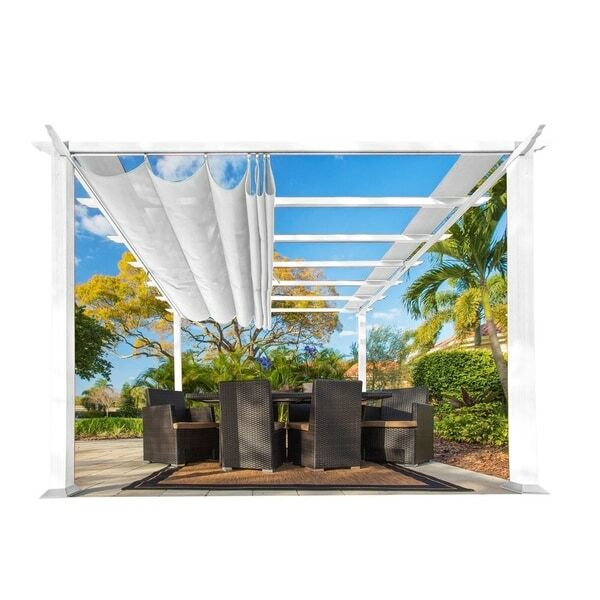 Invite friends over to enjoy this Paragon aluminum-frame pergola with a UV-protected white convertible top. The maintenance-free powder-coated frame easily secures to a wooden deck or concrete slab. This product will ship to you in multiple boxes. Dimensions 132.0 In. X 132.0 In. X 94.81 In. How to Buy Outdoor Furniture That Lasts from Overstock.com. Our guides provide customers with information about how to buy outdoor furniture that lasts. Step out onto your patio. The sky is blue, the sun is shining, and there is a faint chirp of a bird just far enough away to be charming. To complete this perfect day with utter outdoor enjoyment you need a patio space that checks all the boxes of style and function. Start your patio design on the right foot with an attention-grabbing focal point that sets the mood of the space. Whatever your style preferences, this guide will help you find something that’s perfect for you. You want to show off your impeccable patio design to your friends during big parties and quiet get-togethers on your terms, not to nosy neighbors and curious passersby. Reclaim your outdoor space as an extended living area with privacy solutions that keep it seriously secluded. Outdoor curtains are great for blocking out your neighbors while oversized planters hide any unattractive views beyond your property line. Looking for more privacy enhancing ideas? Keep reading to get the low-down on the perfect patio privacy to keep your space secure. Give your outdoor shrubs an added level of dimension by planting them in decorative pots and planters. Planters assist in setting the style for your patio. Whether you decide to replicate your home’s interior decor on your deck or differentiate the outdoor space with a distinct style, you can use outdoor planters to amplify the look. So you want a gorgeous patio with an intentional, thought-out design, but you don’t know where to start? You’re in the right place. Click through these 10 designer patios and choose a style that speaks to your soul. Whether you replicate the design to a tee or simply embrace the spirit of the style is up to you. When the air gets cold in fall, many people store their patio furniture and wait for spring, but if you want to enjoy your patio for a few extra months, then this list of patio furniture can help you extend your patio season. With fire pits, umbrellas, and autumn decor, you can use your patio all the way into November. Take time to smell the flowers as you put your green thumb to work in your own front yard.